The Hoseley Party Dolls are from the same doll mold used for the Mary Hoyer doll and the Richwood Cindy Lou doll and are made of hard plastic. Both were walker dolls with jointed hard plastic bodies, sleep eyes and wore a glued on wig. The hip pin walking mechanisms are often cranky, so Mary Hoyer discontinued the walkers after only a short time. Mary Hoyer met with the Richwood family during this period and the Richwood Cindy Lou walkers with the Hoyer face mold and blank Made In USA marking in a circle on her back, began appearing shortly after that. 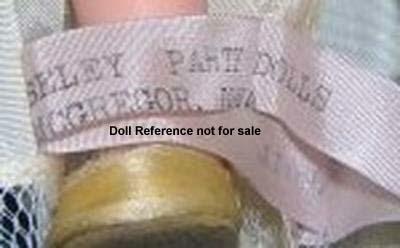 The Hoseley dolls appeared at about the same time and are EXTREMELY RARE! I think Mary Hoyer gave up whatever rights she had to just the walker dolls and they were sold by the manufacturer (whoever THAT was!) to Richwood, Hoseley and possibly others. All photo's are from the private collection of the author, Andrea "Andy". Thanks so much for sharing with us! 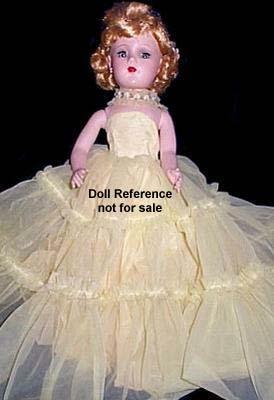 The Hoseley dolls were sold and clothed by a small cottage industry of women in McGregor, Iowa, in the mid fifties, they bought "blank" dolls (generic mark of MADE IN USA within a circle on their backs, with the Mary Hoyer head mold) and dressed them in elaborate formals with lots of gathers and flounces. 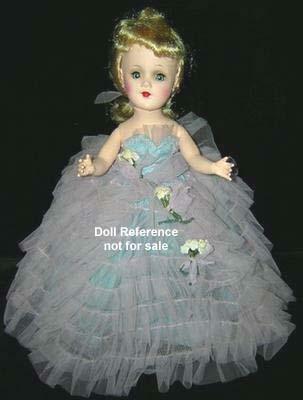 There are fewer than 50 original dolls known to exist today. The only way to identify them for sure, is if they have their original clothing with the Hoseley tag. Each doll had a name, but I don't know if they all had different names, or if they were named according to the outfit worn and there were multiples of dolls dressed in the same formals. 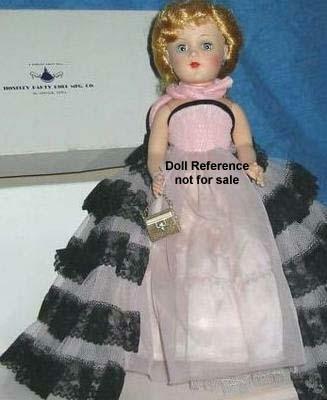 One of the first dolls I bid on in an online auction back in 1998, was a Hoseley Party Doll, I lost the bid, but never forgot the doll - or that face. That's how I started collecting Mary Hoyer's. Five years ago I thought about researching and writing about the Hoseley dolls for a magazine article. Through a series of phone calls to the McGregor Chamber of Commerce and the library, I tracked down one of the women who helped dress the dolls back in the 1950s and spoke with her on the phone. I made an appointment to go there and meet her two weeks later, but sadly she died before we could meet. Someone at the library there told me Hoseley was the last name of the woman who headed the cottage industry group. The Hoseley dolls are found listed in Hard Plastic Dolls, Identification and Price Guide, 3rd Revised Edition, by Pam and Polly Judd, published in 1985, page 111. No photo's in the book but it says the dolls were made in McGregor, Iowa, and dressed as "miniature ladies in 56 different costumes." It continues on to state "they were made of hard plastic, 15" tall and came with various pretty hair styles (hard plastic heads with a wig) circa 1954-1955." I re-measured all three of my Hoseley dolls, and they only measure 14" tall. I don't think the Judd's had one of the dolls in hand to measure. 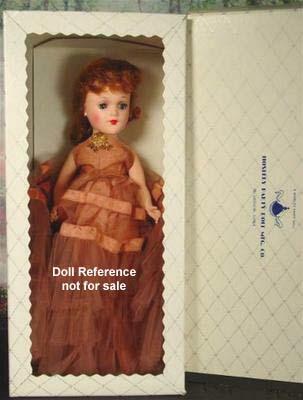 This is the only book or place I've ever seen the Hoseley dolls listed.